Johnny Cash's 'Personal File' In the early 1970s, Cash recorded songs and stories, alone, accompanied only by his acoustic guitar. After his death in 2003, his family stumbled upon the recordings. Forty-nine of them have been collected on a newly released CD, Personal File. We listen to one of the songs, called "It's All Over." In the early 1970s, Cash recorded songs and stories, alone, accompanied only by his acoustic guitar. After his death in 2003, his family stumbled upon the recordings. Forty-nine of them have been collected on a newly released CD, Personal File. We listen to one of the songs, called "It's All Over." 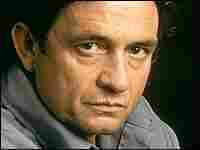 Johnny Cash died in 2003. Not long after, his family stumbled on some boxes belonging to him. They were labeled Personal File. Those boxes contained tapes of Mr. Cash playing acoustic guitar and reminiscing. Forty-nine of those songs have been collected on a new CD called Personal File. Let's give a listen to It's All Over, recorded July 11, 1973. JOHNNY CASH: There were a lot of songs that I wrote when I first started out in my musical career that I never recorded for one reason or another, either I didn't feel good about them, or I felt - or maybe the record company didn't feel like they were up to par or something. But some of those songs must have had something, because I still remember them. And every once in a while, when I'm driving along in the car, I sing them over and over to myself. (Singing) I was on my way to you and I was worried. I was all torn up and nervous 'cause I knew that you'd be gone. I knocked and crossed my fingers while I waited. And I couldn't hold the teardrops when I walked away alone. It's all over. It's all over. My heart echoed it's all over. Every minute that you cry for her is wasted, don't you know? It's all over. It's all over. My heart echoed it's all over. Stop your crying. Turn around and let her go. I'd been running round in circles, like a baby. I was in a daze because I loved you so, I couldn't see. I was broken in a million little pieces when I saw enough to realize you didn't care for me. It's all over. It's all over, my heart echoed. Every minute that you cry for her is wasted, don't you know? It's all over. It's all over, so forget her. Stop your crying. Turn around and let her go. Let her go. Boy, let her go. SIMON: Johnny Cash, It's All Over.